Don’t know about you but when I arrive in a city, one of the first things I tend to do is wander around it aimlessly and see what you can see. 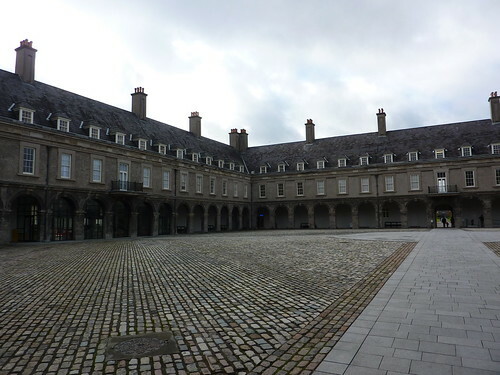 So our first morning in Dublin saw us wandering around, seeing what we could see. We had a plan for the afternoon – a trip to the Guinness Storehouse (more on that later) however we wanted to do that towards the end of the day and we needed something to do before it. Our options were rather restricted as most museums and galleries in Dublin don’t open until about noon on a Sunday, so however we found that the IMMA (Irish Museum of Modern Art) was located not far from Guinness land, and we like a bit of modern art so off we headed. 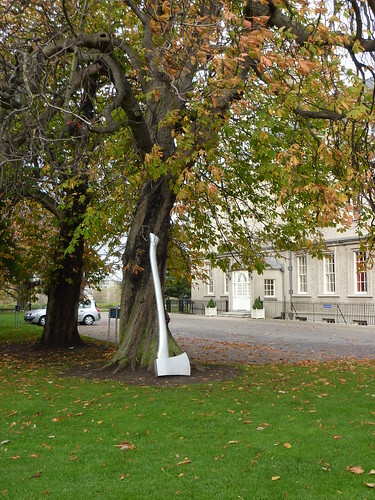 The IMMA is housed in the buildings of the former Royal Hospital Kilmainham, and is a based in rooms around a large courtyard. It all looks rather large and impressive, and my initial thought was how were we going to do this place justice in the time we had available. Okay, it didn’t look as hefty as Tate Britain or the National Gallery in London, but it looked rather large. As it happens, looks can be deceptive and its all rather compact inside – long, narrow rooms, containing mostly sculptures and installations rather than paintings or prints. That said, the displayed collection changes at regular intervals. The small rooms meant a rather cosy atmosphere for viewing the many large installations, and the room sizes mean it’s rather difficult for the place to feel particularly full, even if it was busy – it was almost deserted on our visit, despite it being a weekend and free to get in. Most of the rooms are connected internally, however there’s two gallery areas where you have to go outside and then in through another door in the courtyard. One was so badly signposted, we almost missed it. I confess Catherine’s better at modern art than I am – I spent much of my time looking at things and not really getting them. There was one rather strange exhibit that consisted of a circular curtain rotating around, which you could get in the middle of. All rather fun, although what it actually meant is beyond me. Still, it was free to visit, and the size of the galleries meant you could actually polish most of it off in two hours if you wanted to – we did it quicker as one of the areas was closed whilst they installed a new exhibition.